10 White Nail Arts To Have At Any Wedding! 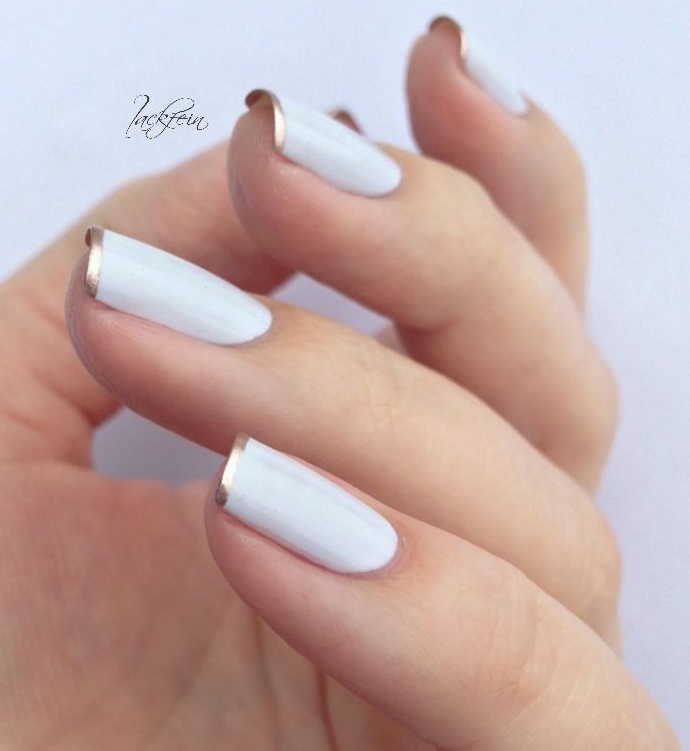 White nail arts, a unique idea to have your nail arts with white nail color. White is a neutral color that you can use on any occasion. You can add more colors such as silver, black, grey or any other relevant shades to go with this color. White nail arts the best to have for wedding or any formal events. When you are going to have a set of white nail arts, you have to check out the type of event you are attending to with this nail arts. You can wear it for any formal event where you have a white shade in your dress. You can wear these nail arts during winter to match with one of your white or grey tops. You just have to match it properly with your outfit and that would be all to get the best compliments with these white nail arts. To get a set of simple white nail arts, you can keep it as simple as having a coating of white nail arts only. If you want to want to ad variations, you can try with one nail with grey, silver or black and the other four nails with white nail color. 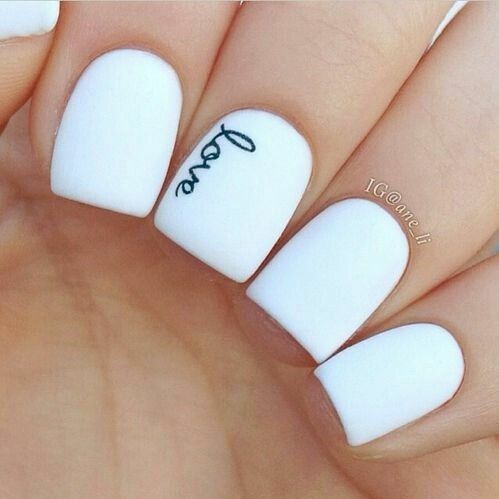 You can get white nail arts with texts written on your nails. For example, you can use a black nail color and a linear nail art brush to write down your name or anything you want to write on your nails. 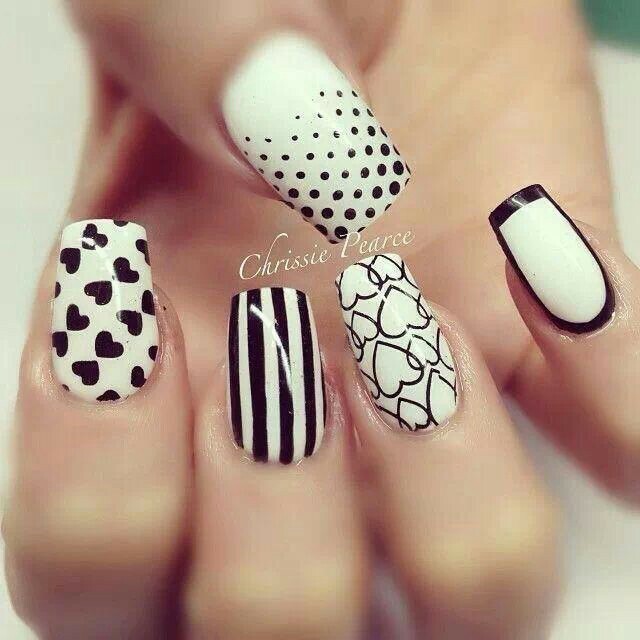 This is also a creative idea to do with white nail arts. Adding a heart or a little bow will give it a pretty look. You can also try the general patterns such as polka dots, stripes, leopard prints, zebra print or anything that comes in your mind to give it a try. For polka dots, you can add more than one color to make it look fancy. You can add two or three shades of nail colors for a stripes patterns. 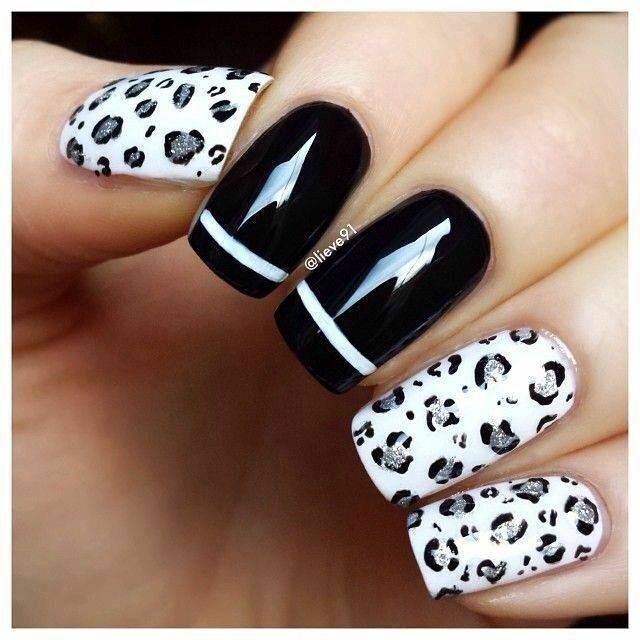 Leopard prints can be done with black and white nail colors. Having geometrical shapes with white nail arts will also be an interesting thing to do. You can do the shapes by adding a coat of nail color as the base color. Then you can cover the areas with a tape on which you don’t want to apply the next color. Apply the other color on top of the tape and let it dry. When it will get dry, pull off the tape and check out the amazing geometric shapes. 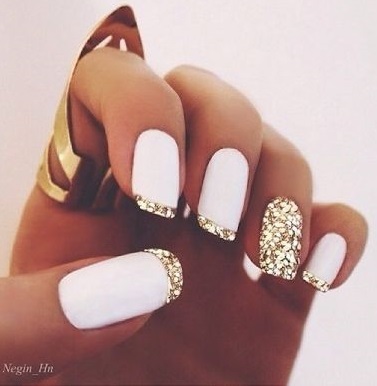 Adding glitters will also make these white nail arts adorable! If you are attending a wedding then glitters would be a perfect thing to add for the sparkles. If you want a coating of sparkles then you can just add a layer of shiny top coat on top of the white nail color. On the other hand, to add glitters only on a little portion, nail tips are the best areas to add some glitters. You can also get the edges or the tips in any other colors you want such as golden, silver, red, blue or any of your favorite colors. If you are attending a wedding as a bridesmaid and wearing something in other color than white then you can add these colors for the nail tips with the while nail arts. You can add colored rhinestones or gems on your nails to make them look more gorgeous! When you are getting while nail arts, make sure that you are not getting it smudged because the white color itself is so neat that applying it in a messy way will make it look worst. So make sure that you are applying it properly with the right shade. Some white nail colors may not bring the perfect white color with a single coating. In that case, you will need more coating of the nail color. Have you selected any of these designs yet? When are you going to get some white nail arts for your nails?